Start with the fenugreek. In a medium sized bowl, put the fenugreek powder and soak it with water for about 1 hour. You will notice that the water will eventually go up leaving the wet fenugreek at the bottom of the bowl. 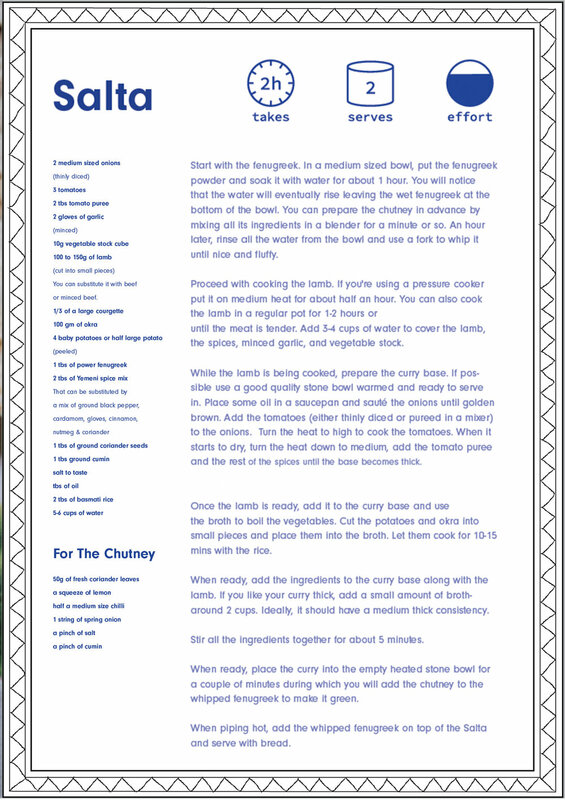 You can prepare the chutney in advance by mixing all its ingredients in a blender for a minute or so. An hour later, rinse all the water from the bowl and use a fork to whip it unless nice and fluffy. Proceed with cooking the lamb. If you're using a pressure cooker on medium heat for about half an hour. You can also cook the lamb in a regular pot for at 1-2 hour or at least till the meat is tender. Add 3-4 cups water to cover the lamb, the spices, minced garlic, and vegetable stock. While the lamb is being cooked, prepare the curry base. Place some oil in a saucepan and sauté the onions until golden brown. Add the tomatoes (either thinly diced or pureed in a mixer) to the onions. Turn the heat to high to cook the tomatoes. When it starts to dry, turn the heat down to medium, add the tomato puree and the rest of the spices until it the base becomes thick. If you have a good quality stone bowl, you can use it to make the curry base. If not, you can heat the bowl on low heat while empty for about 30 mins. Once the lamb is ready, add it to the curry base and use the broth to boil the vegetables. Cut the potatoes, okra and corrugate into small pieces and place them into the broth. Let them cook for 10-15 mins with the rice. When ready, add the ingredients to the curry base along with the lamb. If you like your curry thick, add a small amount of broth. Ideally, it should have a medium consistency. The broth should be around 2 cups of liquid. You can add regular water as well. Mix all the ingredients together for about 5 minutes. When ready, place the curry into the empty heating stone bowl for a couple of minutes during which you will add the chutney to the whipped fenugreek to make it green. When piping hot, add the whipped fenugreek on top of the Salta and serve with bread. 2 medium sized onions (thinly diced). 100 to 150g of lamb (cut into small pieces). You can substitute it with beef or minced beef. 4 baby potatoes or half large potato (peeled). 2 tbs of Yemeni spice mix. That can be substituted by a mix of ground (black pepper, cardamom, gloves, cinnamon, nutmeg & coriander). 1 string of spring opinion. Listen to the International Dish episode - coming soon! 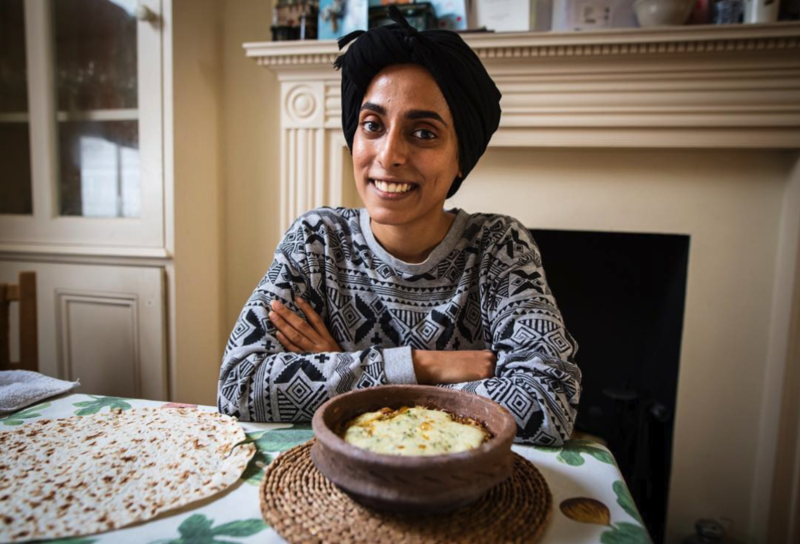 To taste Fatma’s Yemeni cooking head along to her fabulous London Pop-Up - Meet Me At Fatma’s. Find out more on her instagram @meetmeatfatmas. Downloadable & printable versions of the recipe are available as single pages or double page spread. Illustrated border by Yemeni illustrator @intibint. Layout by Parallelogram.